Inspection of the water tower walls by drone and aerial photogrammetry. Results obtained from 1225 aerial images taken by the company D-tection. Inspection to detect and locate surface defects (concrete break-ups and visible reinforcement rods) on the entire structure. 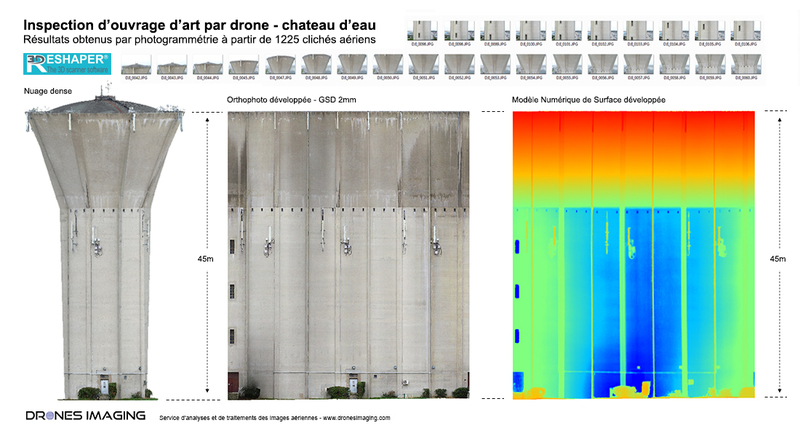 Thanks to the software 3DReshaper, Flatness analysis of the DSM (Digital Surface Model generated by aerial photogrammetry) allowed the algorithmic detection of wall surface defects (concrete burst) and their classification by severity levels (hole depth). Subsequently, the RGB orthophoto (layered on the DSM) also allowed the defects to be textured in order to precisely identify their level of gravity (by photo interpretation). Aerial Images source : D-tection company. Airborne platform : DJI Phantom 4.